Jonathan Hickman (THE MANHATTAN PROJECTS, Avengers) and Nick Dragotta’s (HOWTOONS, FF) New York Times bestselling and Eisner-nominated science fiction western series EAST OF WEST begins the countdown toward the Apocalypse in issue #14 as it marches toward chaos and ultimate doom. Death has left the Horsemen and roams the land searching for something that has been taken from him while his former compatriots plot his downfall. Political stability has given way to outright strife, and war is inevitable as The Endless Nation makes the first cut in the carcass once called America. "Two issues left in YEAR ONE of the Apocalypse, what Nick and I feel is some of the coolest stuff we've cooked up yet, before we crash headfirst into YEAR TWO. We couldn't be more excited with how we're wrapping up the arc," said Hickman. And Dragotta simply called it, "Maybe the grossest, most disgusting issue yet." Readers won’t want to miss out on the incredible suspense and hell-for-leather momentum of EAST OF WEST as the series barrels toward the event of the year and the showdown of a century. 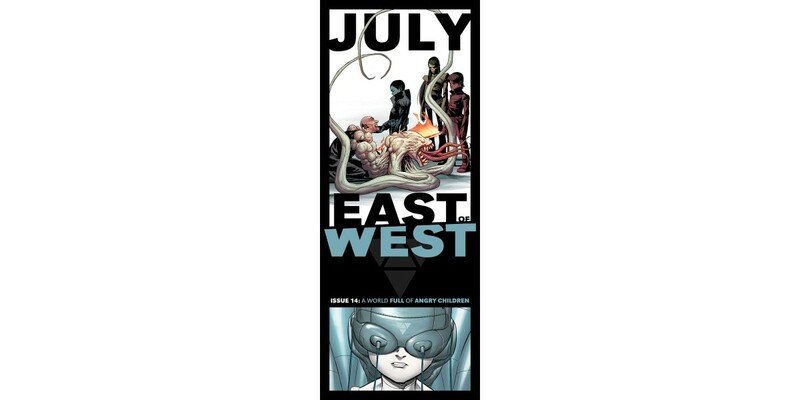 EAST OF WEST #14 arrives in stores on 7/30, and will be available for $3.50. It can be pre-ordered with Diamond Code MAY140703. The final order cutoff deadline for retailers is 7/7.